Shannon offered advice and feedback that was crucial to the house selling quickly. We had a substantial offer within 48hours of listing. Shannon was a delight to work with and very knowledgeable. She keeps you informed every step of the way. Shannon was super helpful with keeping us updated on what needed to be done. Shannon was simply the best! I was making a purchase from another state and she was incredibly helpful from start to finish. Shannon was able to listen to me for what it was that I was looking for in a house and had the experience to help guide me through the other aspects of the buying process that I had not given much thought. Shannon and her team made the process pleasant. She is very knowledgeable and honest. Shannon was superb! No pressure to buy. Answered all of our questions or found out the answer. Shannon's real estate knowledge and experience was very helpful as we navigated the inevitable difficulties of buying and selling at the same time. We had tried for 2 years with 2 other realtors with no results. Shannon listed it on a Tuesday and started showing it the next Saturday. We had a contract in about 4 weeks. Shannon was down to earth and warm, respectfully direct and incredibly insightful; all things that I value especially feeling out of my comfort zone discussing real estate. Shannon is exceptionally knowledgeable and a real go-getter, which made our buying experience a breeze. She was super-responsive to our many question. Shannon made our dreams a reality by helping us purchase our forever home! Her 20 plus years of experience and knowledge are invaluable and I could have picked her brain all day if there were enough hours. What I find so impressive about Shannon is not only her honesty and integrity but the incredible manner in which she combines being highly professional with a personal touch. Shannon was involved from the moment we even entertained the idea of selling. She offered advice and feedback that was crucial to the house selling quickly. She was professional, courteous and accommodating. I have recommended Shannon to friends and acquaintances who need a solid, professional realtor, and I will continue to do so without hesitation. She represents her clients with zeal and an involvement that few Realtors can match. It was wonderful to have Shannon representing the seller for a home which was purchased by my client. She represents her clients with the utmost professionalism and expertise. Shannon was the perfect realtor for my wife and me as we bought our home in Charlottesville. Her great sense of humor, interpersonal skills and approachability made her a joy to work with. Shannon was such a pleasure to work with - so responsive and helpful, and deeply intuitive about finding the right place for you! She knows the market, is an excellent negotiator and is dedicated to looking out for the best interest of her clients. She has a high level of energy and is a delight to work with. She was sensitive to the needs of her clients, found just what suited us, and worked with us at every stage of the process to make it understandable. Shannon guided me through the process and was not only available to, but interested in, answering my many questions. If you are needing to buy or sell a property and need a realtor you can count on to close the deal - Shannon Harrington is who you need to call! You priced it right, assisted the buyer, and respected my interest with unbeatable professionalism. She is one of the most honest people I have met, personally and professionally, and comes with my highest recommendation! Shannon allowed us to have fun each step of the way and I'll never forget this experience. 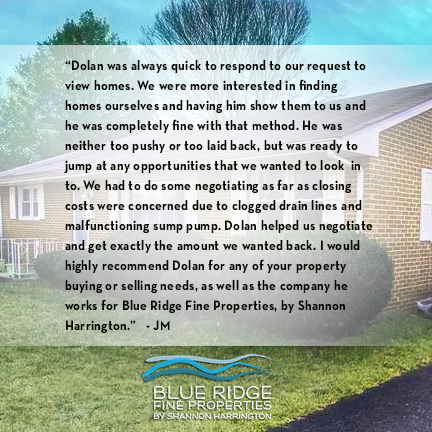 Ultimately, working with Shannon helped us save time and money and her honesty from the beginning let us know we'd made the right decision for our needs! She had a sincere interest in placing me in a home that fit my style and my preferences, and patiently walked me through every step of the process. Shannon was very enthusiastic about our listing and highly motivated. It was not exactly an easy sell but she was quick to highlight the unique attributes of the property. Our purchase of a foreclosure went very smoothly, and I contribute that to Shannon's expertise and advice along the way. Shannon was integral to helping us find our home. She has an instinct and a wealth of experience to draw from. She's a fantastic communicator, timely and accurate. If I am in need of a realtor again in the future, she will be the first person I call! Shannon and her team were always available. I felt like my sale, and business, and well being, were important and well cared for. She and her team made the process pleasant. She was true blessing to us through the whole process! We really enjoyed working with her. I have bought and sold dozens of homes and none was as difficult a transaction as the one she managed to bring to fruition. Shannon's experience renovating old homes makes her ideal for older home buyers since she can give a basic analysis of the structure and systems while looking at the house. Her responsiveness was fantastic, she was invaluable in negotiations, & she was able to do in 60 days what no other realtor had accomplished in 2 years. They brought their personal knowledge and experiences to the table and found us the perfect location and new home. She helped us purchase a house in Staunton. Highly recommend Shannon! Shannon was wonderful. A true pleasure to work with and I would highly recommend her to family and friends alike. We enjoyed her honest opinions and that she shared her obvious experience with renovation. Shannon was simply excellent to work with. Very attentive to detail. We would recommend her to anyone who wants a genuine, honest, and talented realtor!! Not only did Shannon work with us to find exactly the right house but she was with us every step of the way through the negotiation and mortgage processes. In addition to being friendly with a good sense of humor, she really worked on my behalf as an advocate and (at times) mediator. If you are looking for a responsive, professional, creative, intuitive realtor who will be honest with you, look no further. Shannon Harrington is the realtor your have been looking for. Being first time homebuyers, my husband and I were very nervous about the whole process. We were so lucky to find Shannon!! Shannon was extremely helpful in helping us, as new home buyers, to find the perfect house. Her suggestions during the price negotiation was outstanding and really made the difference between our actually buying and not being able to buy. She worked with everyone well, was supportive of my requests and helped me understand every step of the process as a first time home buyer. Thank you Shannon!!! I love historic homes and that is what drew me to Shannon – her expertise and passion for restoring these homes. From there, throughout the process, Shannon has been very honest and was able to take care of any issues that arose. The only way she could have been better is if she had bought the house for us. Shannon Harrington is a dream come true. I find it very difficult to convey just how wonderful Shannon was in helping me through this process. I recommend Shannon for all your real estate needs! Shannon is an expert on historic property and knows her market well! There is no one more dedicated than Shannon to her clients. She is a person of great character both at work and in life, and will make sure the transaction is done correctly. I sincerely appreciate her willingness to help and lead me through all the steps that led me to buying my first home. I found her to be honest and trustworthy, which was the most important thing to me. She was knowledgeable and a fantastic negotiator. Shannon was very available and responsive all during the process of selling my house. Shannon did a great job of walking first time home buyers through the process. Shannon is a great communicator. Shannon was helpful and a great listener when it came to our concerns and issues. Shannon was so great to work with. She listed our home and got us a great price and the whole thing happened in about a month. She really listens to my preferences and concerns and is never "pushy." You are a true example of a Realtor with integrity and efficient professionalism, who knows their job and does it well! Shannon is incredible, in so many ways. She offers the knowledge of a professional Realtor, the experience of a home renovator and the honesty of a friend. For anyone who hasn't worked with Shannon Harrington, you're missing out and should correct that immediately. I couldn't have scored the incredible deal I did without her negotiating skills, persistence and instincts. Thank you for bringing us a full price offer in three days, after a month of no success on our own. Everything went soooooo smoothly, and you were always there when we called, or got back to us right away.